Engineering professor Brianno Coller’s epiphany came when he was showing a NASA-produced video of a mission to Mars to a class. Something shifted in the air. The students’ body language changed. As the students watched the video of simulated spacecraft and Mars rover, they were engaged. Energized. “As soon as the video was over the moment was gone,” Coller said. Coller realized the magic element was the combination of engineering systems they had been studying and the simulation showing them how the theory played out in real life. This was the germ behind two video games Coller designed. In the first, EduTorcs, students program racing cars using the formulae they would be using in class. In Spumone, students apply physics principles to navigate a vehicle through a subterranean world. With the games, the students can see the result of their work before their eyes – a win if they’ve applied the physics and mathematics to their benefit, a fiery crash if they did it poorly. “Learning is all about failing and failing over and over again until you get it right,” Coller said. 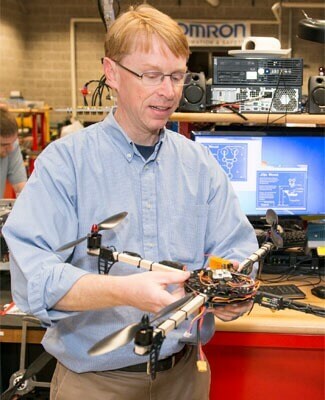 It is that innovative approach to education, both through new means of teaching and through his work mentoring NIU College of Engineering and Engineering Technology students, that earned Coller the Illinois Professor of the Year award for 2015. The honor, announced today, is given by the Carnegie Foundation for the Advancement of Teaching and the Council for the Advancement and Support of Education. It salutes the most outstanding undergraduate instructors in the country – those who excel in teaching and positively influence the lives and careers of students. It is the only national program to recognize excellence in undergraduate teaching and mentoring. Coller follows in the footsteps of NIU Professor of Anthropology Dan Gebo, who was selected as Illinois Professor of the Year in 2014, and is a worthy successor, NIU President Doug Baker said. 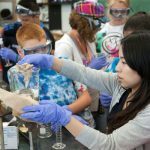 “Students learn best when they are fully engaged in hands-on projects that allow them to solve problems. Dr. Coller is a master teacher building that engagement, and we are proud to have him as an NIU faculty member,” Baker said. 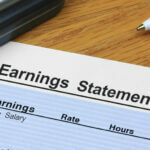 Traditionally, engineering education has involved abstract concepts directed at practical people. Coller’s approach is one that resonates with students. Coller’s teaching extends beyond the classroom. During the 2014 Winter Olympics, NBC approached Coller to explain the physics of the half-pipe. 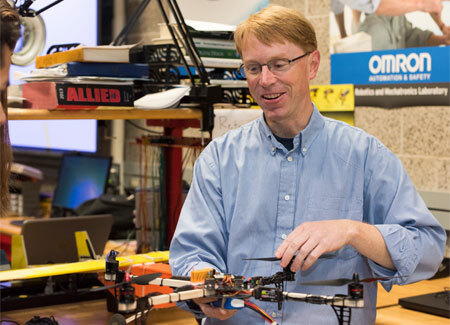 He has served as the adviser to student groups that build mini-baja racers and Formula 1 cars and currently works with clubs that design, build and compete with drones and model air craft. Pradip Majumdar, chair of the Department of Mechanical Engineering, said one of the secrets to Coller’s success is that he has “turned his classroom into a laboratory” and excels at explaining complex topics to students. “I have been teaching 30 years myself, so I can tell you he is one of the best teachers I’ve seen,” Majumdar said. Coller’s path to engineering started with youth soccer. The Reno, Nev., native went to San Francisco for a soccer tournament when he was around 14. He found himself amazed by the city’s buildings, bridges and other structures. “I had to figure out who does that, and I found out it was an engineer,” Coller said. He earned his B.S. in mechanical engineering from Cornell, where he would go on to receive his Ph.D. in theoretical and applied mechanics. “It was just one big road of fascination, things got more interesting every year,” he said. After college, he went into the private sector. He soon found building communications satellites wasn’t challenging enough. When he was a graduate student, he had the opportunity to teach some math courses, where he found a new turn in that road. “I loved the teaching and I loved the opportunity to chart my own research path, so becoming a professor was the natural thing to do,” he said. 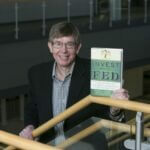 He pursued a career in academia, joining NIU in 2003. Coller approaches teaching with an engineer’s mindset: always tinkering, always measuring results, always throwing out things that don’t work, even when it hurts. “There are learning interventions that I’ve spent 30, 40, 50 hours developing and completely jettison it if it doesn’t work,” he said. Majumdar said Coller also excels at reaching out to students, developing a one-on-one rapport with each. “He is extremely good at mentoring them. He always makes enough time to talk to them. You can see students always waiting to talk to him,” Majumdar said. Cummings praised Coller for making every moment a teachable one, even the homework. “I tend to think of myself as still a kid, kid meaning 18- to 25-year-old. I think what resonates most with students is that I am incredibly interested in their learning,” Coller said. The kid is married, with two kids of his own. The family lives in Batavia. 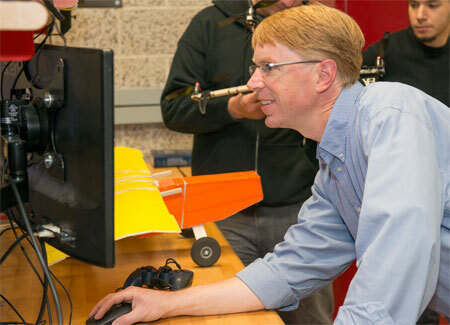 His current research studies flying vehicles – drones and aircraft – to develop algorithms allowing machines to fly themselves. He’s working in real life on this one, no Spumone-style video games, just a college professor and his students flying hand-built drones outside.